Interface de Áudio USB 2.0 de segunda geração de 2 entradas/4 saídas, dois pré-amplificadores Scarlett para microfone/instrumento, 24 bits/192 kHz e USB Bus Power. Software de gravação Pro Tools | First & Ableton Live Lite, plug-ins e samples incluídos. Compatível com Mac e PC. Pontuação: #TOTAL_SCORE# de 5 com base em #TOTAL_NUMBER# comentários. Works well for live shows and home demo recording. I mainly use it live to send multiple mono tracks to the front of house. While keeping a stereo click track mix on the other two tracks for my drummer. Amazing specs and works phenomenally. Great product for a great price. the sound is remarkable. Perfect for what I need: provides basic home recording with 2-4 inputs, and also acts as my small, easy-to-transport interface for live shows. Great interface, would recommend to anyone that needs a better sound i/o solution for a computer. Works great on linux, sound input is one stereo track tho, left channel is for input one and the right channel is for input two. Setup is pretty straight forward. Sound recording quality is very good with several different devices. Great selection of bundled software. I found this interface amazing, practical and very useful. I think it’s one of th best options if you want to start making music. Great product at great price with next day delivery. What's not to like about the whole deal. It was delivered very fast from UK to Austria and it is really a high quality product, works very well for home recording. Excellent product. works great. Appears to be a brand new product and I ordered a refurbished unit. Great savings. Fast shipping. Software package bundle is incredible. Big learning curve but now it does everything I needed. Will definitely buy again. Great interface, it's definitely the 200eur worth. I also love the huge amount of plugins. the scarlette 2i4 is perfect for any small scale home studio. Giving you 2 inputs to use allows you to record drums live using over head mics or you can hook up a midi controller and use the many drum samples and create awesome drum tracks. I would highly recommend this unit for anyone looking to get into recording as its perfect for individuals and works well on larger scales including recording full bands. Very nice product, works very well. Very satisfied. I really like the product. Very easy to use! I like this product and have used it for a number of years. My first one malfunctioned but I honestly think that was a combination of being in the heat of my car and a roof leak in my studio. A good, easy to use, quick to set up and portable audio interface. It looks more sturdy then it actually is. The set up video tha was sen jist before I got it was perfect! It was easy to set up and it was ready to use.Very good! Aside from UPS screwing up my delivery and saying that the seller didn’t put a postal code or a street name on the address label (a complete lie btw), everything was great. Got my package a couple days late but I blame UPS. Bought a refurbished version direct from focusrite and it arrived in the proper box. Expected to see some minor scratches as they said might be the case, but mine looks brand new and never used. The pre’s sound great, exactly what I expected from all the research I did before buying, and I saved $ by going with the refurb. All in all, I’m completely satisfied. Great device with lots of functionality for a reasonable price! It's my first interface and I think it's the only one I'm going to have, it have everything I need and the design is perfect. Best quality for the range of price. Love the Scarlett 2i4, it meets my recording need seamlessly. Very good product. Big improvement on my previous sound card. 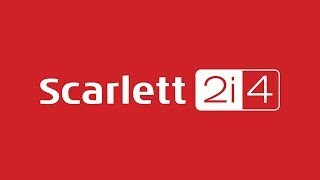 The Scarlett 2i4 is a great Allrounder Audio interface since it provides everything you need in a handy way with a great price. I couldn't be more happy with my purchase. On Focusrite the free bundle that came with my Scarlett is huge and really useful stuff. From Daws to Samples... Thanks! Excellent device. Beautifully made and works incredible. Pretty good, i would suggest it to anyone out there. Genial, es muy cómodo poder cargarlo a donde sea que se necesite la interface es genial, además los adicionales que se agregan por la compra son buenos. Es una buena compra a buen precio, aprovechen. so sattisfied abouy my product. It was very easy to purchase from the Focusrite site. My refurbished 2i4 was recieved within 4 days of my order, in pristine condition. I am very pleased. Good product, but it would be better with more detailed explanation. So easy to use! Plug and play in the truest sense. Such low latency. Looks great on my studio desk, is economical from a design and cost perspective. It is a fantastic product. Does it's job and it's very easy straightforward! Excellent product, high quality and perfect for the job. Excellent Interface , Look, and quality. Really fantastic product. Solid build and works extremely well. I would highly recommend this product. does exactly what is advertised, sounds excellent completely worth the price. I have no previous experience in audio recording, I bougth this product because is the most recomended device in the media. The first experience I have is awesome and Focusrite has a lot of tutorials. The only con it has is the compatibility with Windows 10 because of the software (protools first) and some drivers. Some things you have to install in Win8 compatibility mode. Hope this get better. fantastic product ,i love everything about my 2i4 , it's built strong all the buttons are easy to access ,it's just the right size i'm happy that i purchased focusrite instead of the others that i looked at, of whom i won't mention. I give it 5. Fast, few issues. Sounds awesome. I have the first generation as well. I'm absolutely in love with this interface. It gives you a pure uncolored tone straight into your computer. I'd recommend this over the 2i2 or the solo as the pad and midi functions are invaluable. I play active basses and as such without the pads the sound is far too clipped and unpleasant. However, with the pads you get pleasant full tone without any clipping all without a di box. This interface also serves as a midi solution as you can send and receive midi input or output straight from the computer or your keyboard. I honestly say this interface is the heart of my studio. I can't record without it. This score will rise as the drivers mature. I've had some issues with stability and also the buffer length resetting on each restart, which have been confirmed as known issues by tech support. Focusrite says they're working on it and I trust that. However, I can't rate this product higher until those fixes happen. That said, I've owned several Scarlett interfaces and the overall quality isn't an issue. Just realize that early adopters always risk experiencing some problems. Scarlett 2i4 (2nd Gen) is superb. I'm getting 2.6ms roundtrip latency on a W10 machine at 192k/16smpls. If you use a cpu-light host like Reaper you can do everything. Amazingly superior audio I/O hardware at any price! Lowest latency, pristine mic-pre's, USB connectivity, and of course the included Focusrite Plug-In Package make this a great choice for the entry/home studio level musician on the go. I've been using different DAWs with my 2i4, including Protools 12, Cubase and Ableton for Windows, and have created great sounding tracks. Fantastic choice. I use this for all my recording, and when I upgrade, I'm still going to stick to focusrite... The sound and build is fantastic. NOVO SOFTWARE:O instrumento virtual Addictive Keys da XLN Audio é grátis com as interfaces Focusrite. Uma licença completa por conta permite escolher um instrumento Addictive Keys, como Modern Upright, Studio Grand, Electric Grand ou Mark One. E receba ainda gratuitamente o instrumento virtual Addictive Keys da XLN Audio com as interfaces Focusrite. Uma licença completa por conta permite escolher um instrumento Addictive Keys, como Modern Upright, Studio Grand, Electric Grand ou Mark One. Com a Scarlett 2i4, as suas gravações irão ter exatamente o som que pretende. Duas entradas de combinação com pré-amplificadores de microfone Scarlett de som natural, entradas de nível de linha e entradas para instrumentos com novo design permitem gravar tudo aquilo que deseja. As quatro saídas analógicas e a entrada/saída MIDI fazem da Scarlett 2i4 ideal para produtores musicais contemporâneos, recorrendo a sintetizadores externos ou atuando ao vivo. Utilize as saídas de conector equilibrado de 1/4 polegadas para efetuar a ligação a monitores de estúdio profissionais, ou as quatro saídas RCA para ligar a um sistema de altifalantes doméstico ou um misturador para DJs. O Studio Session Analyzer é uma aplicação independente com uma ampla gama de opções de análise para todas as aplicações de análise e medição de áudio imagináveis. Inclui o plug-in SampleGrabber, que envia áudio da DAW para a app, que analisa o áudio em tempo real. Opcionalmente pode também obter 50% de desconto no Studio Session Pack da Flux ou nos upgrades do Pure Analyzer Essential da Flux. Clique aqui para visitar a página inicial da Plug-in Collective para obter mais informações. A segunda geração da gama Scarlett tem inúmeras atualizações. A nova latência* superbaixa irá dar confiança à sua atuação, permitindo-lhe gravar e monitorizar com efeitos de software em tempo real. Os novos controlos de volume em metal e a estrutura metálica vermelha mais elegante acentuam o seu design industrial otimizado, concebido para levar para qualquer local. A gama Scarlett também funciona agora com taxas de sample até 192 kHz, e os canais de entrada também foram alvo de evolução. O mais recente pré-amplificador de microfone Scarlett integra agora uma estrutura de ganho mais uniforme, para que possa ajustar os níveis com precisão. A entrada de instrumentos também foi completamente redesenhada para suportar pick-ups de guitarras elétricas com som muito mais quente. Por fim, a Focusrite integrou circuitos de proteção analógicos nas entradas e saídas, a fim de proteger a sua interface contra picos de corrente indesejáveis. Compacta e portátil o suficiente para levar para todo o lado, nem sequer precisa de uma fonte de alimentação; a Scarlett 2i2 é ligada e alimentada por um único cabo USB. Integra igualmente o software e os efeitos de que precisa para começar a gravar; uma versão exclusiva do Pro Tools | O primeiro pacote criativo da Focusrite, Ableton Live Lite, conjunto Softube Time and Tone, conjunto de plug-ins Red da Focusrite, 2 GB de samples Loopmasters e muito mais.